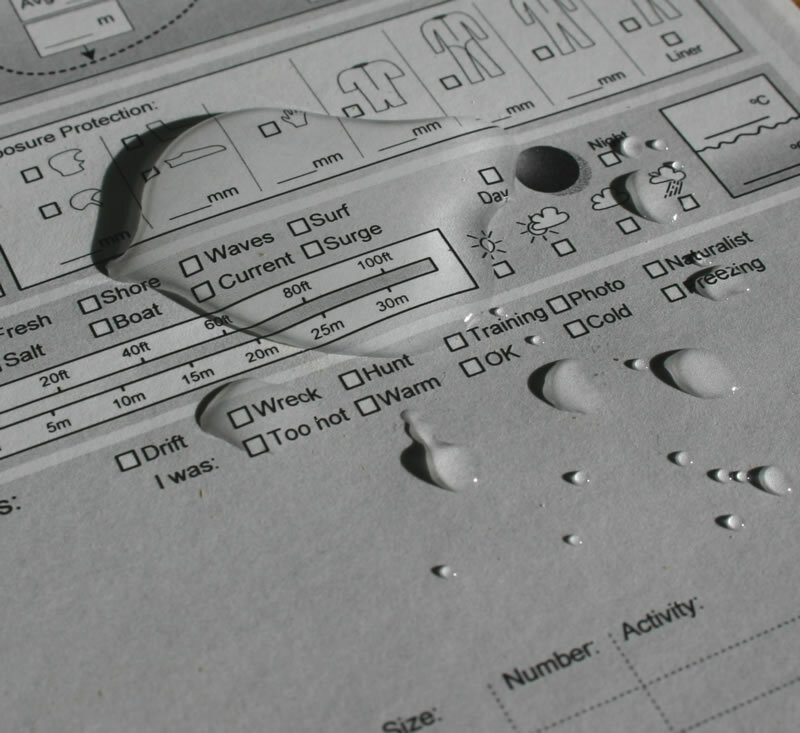 DiveLogs - Rite in the rain water resistant scuba diving log books. 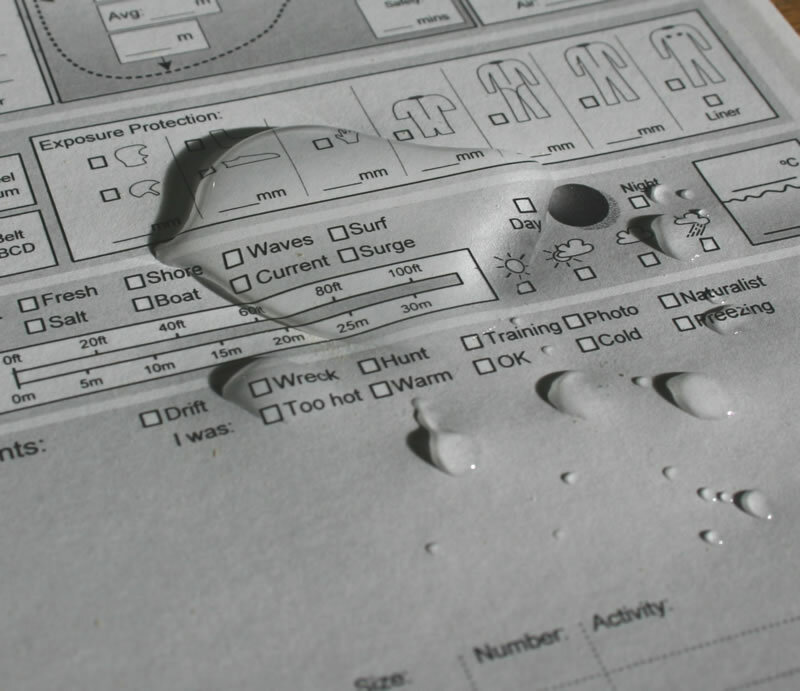 On all our scuba diving log books we offer an optional upgrade of water resistant paper by 'Rite In The Rain'. This is an amazing material! It looks just like paper, it feels just like paper, and you can write on it with a ballpoint just like paper. But, unlike normal paper, you can run it under a tap for minutes and it just shrugs the water off! In tests, we have even immersed it for a minute, taken it out, padded it dry with a towel, and then started writing on it with no problems! When water is poured on it just pools on the surface - it does not get absorbed. 5 minutes later and the water is still just sitting on the surface. 10 minutes later and we dry it off with a cloth and can still write on it! If you want a log book that can stand up to the worst of conditions then this is for you! The secret is a special coating that is put onto the paper in a unique process. Another nice feature is that both the production process and material are environmentally friendly; the paper can be disposed of normally, unlike some plastic papers. Of course, any water based ink pen (such as fibre tips), and log book stamps, will not work on a water repellent coating so you may want to think twice if you will be using these. Finally, the makers of the paper recommend that Space Pens are used with it because of the design of the ink. However, we have found that a good quality ball point will usually work just as well. 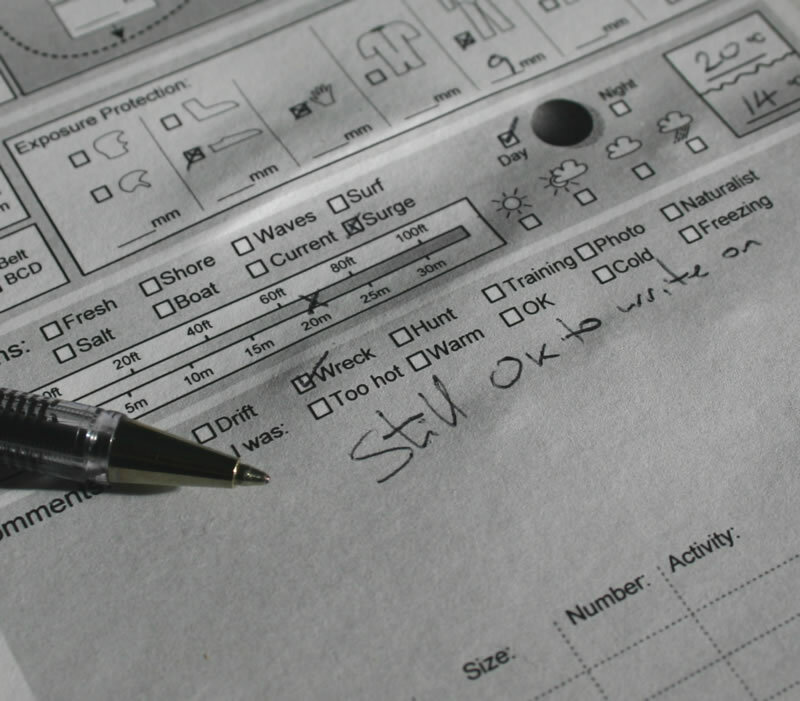 We are so impressed with the qualities of the paper that we have it as an optional extra to the entire DiveLogs range. A small upgrade cost of £2.46 (£2.95 inc VAT) per pack will mean Rite in the Rain paper will be used - even in our Log Designer service.Just look out for the opportunity to upgrade as you add items to your shopping cart. Please note that Rite In The Rain can be taken underwater for short periods, but is not fully waterproof like our underwater dive log refills.